Last month was Allison's birthday and we finally utilized her San Francisco backyard by throwing her a Sunday birthday BBQ, hosted by her husband, Chris. Check out Niky's post on Allison's Birthday BBQ! It was a beautiful sunny day and her backyard is such a gem - a hideaway from the city life. I made a couple items for the BBQ including Asparagus Pesto Pasta, Caprese Salad, and a deliciously tart - perfect with vanilla bean ice cream - Rhubarb and Strawberry Crostata. Definitely a recipe keeper in my book. Crust: Combine both flours, sugar, and salt in a food processor. Blend for a few seconds to combine. Add butter and pulse until butter has formed small pea size pieces. Whisk egg and milk. Add to food processor and pulse until the mixture begins to clump and hold together. Remove from processor to a large piece of flat plastic wrap, pressing mixture together into a ball. Flatten balled mixture and wrap plastic wrap around dough. Refrigerate for at least 1.5 hours. Filling: Dissolve cornstarch in 3 tablespoons water and set aside. Combine rhubarb and strawberry slices with 1/3 cup sugar in a large saucepan. Cook over medium heat. Sugar will dissolve and juices will begin to come out of the fruit. Once there is quite a bit of liquid in the pan, about 5 minutes, add cornstarch/water mixture and bring to a boil. Do not overcook. All fruit should still hold its' shape. Remove from heat and transfer to a bowl. Chill until cool. Preheat oven to 400°F. Roll out dough on floured parchment paper to about a 12" round. Use additional flour as necessary. Brush dough with beaten egg. Mound filling in center. I did not use all the filling but I tried to use as much as possible since the fruit will cook down. Fold edges of dough over filling to create about a 1-1/2" crust. Brush with egg and sprinkle on raw sugar. Sprinkle additional regular sugar in the center filling. I tasted my filling and thought it needed extra sweetness. I used about 1-2 Tbsp of sugar. Slide parchment onto a large baking sheet and cook for about 45 minutes. Crust should be golden and filling should be bubbly. Some of my juice ran out from the crust, which is okay. Let crostata cool and transfer carefully to a serving platter. Cut into wedges and serve with ice cream. Before our 4th of July festivities (check out Niky's blog post here) I made these delicious stuffed mushrooms for a girlfriend, Nicole, and myself while we waited for the activities to commence. I typically don't eat ground beef for numerous reasons that every foodie reading this blog post understands. But, you can find grass fed ground beef at Trader Joes and what the heck - I had a craving for beef. I garnished the dish with micro greens and a fried egg to give it a brunch twist. However, it would be great as a dinner with a side of roasted vegetables (asparagus would be great) or a greek style quinoa salad. One note about the recipe: After I wrote the ingredients/steps it looks a little long and complicated, but it's actually quite easy. Also, I'm a little uneasy about the temperature ground beef is cooked to so I cooked the stuffed mushrooms until the internal temperature was 160˚F (or well done). Feel free to cook the mushrooms to a temperature you are comfortable eating. Note for Roasted Red Pepper (or use store purchased): Preheat over to 450 F. Roast ½ red bell pepper on baking sheet for about 20 – 30 minutes or until skin is mostly black and bell pepper is soft. Combine ground beef with diced red pepper, onion, mint, garlic, crushed red pepper, salt, and pepper. Mix well. Remove stems from mushrooms and clean mushrooms. Stuff beef into mushrooms. Mound high because the beef will cook down. Place in baking dish and bake at 375˚ for about 30 minutes or until meat thermometer reads about 160˚F. Meanwhile, combine yogurt, roasted red pepper, garlic, mint, vinegar in a food processor. Blend until smooth and season to taste with salt and pepper. Pan fry eggs as a garnish (not necessary). Place micro greens on plate and top with mushrooms, tzatziki sauce, and fried egg. My amazing sister and best friend, Sarah, got married this weekend in San Juan Capistrano at a venue called The Villa. I cannot wait to share pictures with you. Her wedding was the best weekend of my life and it wasn't even my own! For lunch last week, I made a version of the rice-less sushi roll: Mediterranean Hand Rolls. Last time I made sushi in the typical roll style and found them a little difficult to keep together, which I believe was from the lack of rice. Hand rolls may be the way to go with rice-less at home sushi rolls; especially if you are a novice like me. I hope you had an amazing Memorial Day weekend! In a food processer blend together the beans, cumin, garlic clove, and juice from 1/2 lemon with enough olive oil to make the mixture come together (hummus consistency). Mix together the drained tuna, remaining lemon juice, and olives. Season to taste with salt and pepper. Add dijon mustard and olive oil to taste. Saute mushroom slices over medium heat with a little olive oil and salt and pepper until tender. Cut the seaweed sheets in half lengthwise. Hold sheet in one hand. In one corner spread a little of the hummus. Top with a small amount of tuna mixture, mushrooms, and arugula. Dab a little water in the corner nearest the mixture and wrap that corner up and over the mixture till the corner meets the seaweed sheet. Continue to wrap the remainder of the sheet into a cone. Use water at the end to keep the sheets together. Please watch a youtube video for further instruction - I did! My roommate, Ashlee, came up with this amazingly simply recipe for quick no-rice (also no cook) sushi rolls. Perfect for you Paleo lovers out there. I made mine into pseudo sushi rolls; however next time I think I'll make hand rolls. It was not an easy task to keep the roll tight enough to hold the ingredients. My next version will be a combination of sautéed mushrooms, arugula, tuna, and lemon dipped in a pesto sauce for a Mediterranean twist. I'll let you know how it goes! Combine canned tuna, fresh lemon juice, grated fresh ginger, salt, and pepper in a bowl. Place seaweed sheet onto a working surface. Take a paper towel and moisten with water. Lightly dab seaweed sheet with moisten towel until seaweed becomes pliable, however not soaking wet; the seaweed will fall apart if too wet or break apart if too dry). Place 1/2 of the tuna in the center of the sheet. Place 1/2 of the vegetables on either side of the tuna. Pull one end of the sheet over the mixture and tuck in tightly. Take other end and wrap over the folding end. The water should cause the seaweed to stick. If you prefer an easier route - just make hand rolls! Slice into desired sizes. For Easter Allison invited me to her parent's house in Novato. 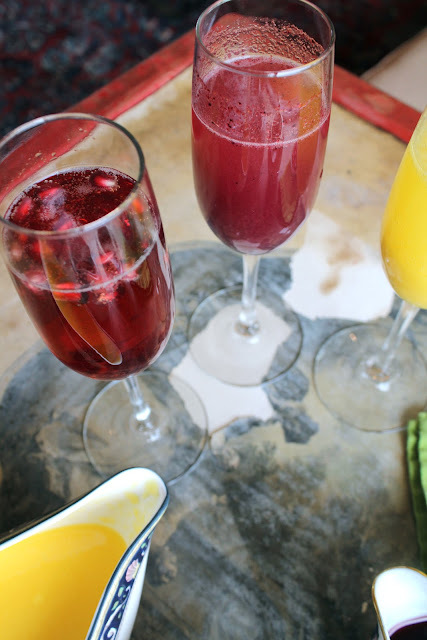 To start our Easter Sunday we made a Bellini Bar consisting of Mango, Blueberry, and Pomegranate Bellini's. Such a fun way to drink champagne for a holiday or party, plus a new twist on the traditional Peach Bellini. Allison also made a family appetizer tradition: Goat Cheese topped with fresh thyme and olive oil and baked at 450˚ F for 5 minutes until the top is browned. The dish is served with bread/crackers. So delicious and simple, it may become a typical appetizer of my own. For dinner Allison's Mom made Lamb Provencal with potatoes, onions, and tomatoes, stuffed artichokes, salad, and strawberry shortcake. Simple Syrup: Add 1/2 cup sugar and 1/2 cup water to medium saucepan over medium high heat. Stir until sugar is fully disolved. Remove from heat. Mango: Puree mango chunks with juice from one lemon, 1 - 2 Tbsp of simple syrup to taste, and water to thin consistency. Continue to add water until puree is pourable. Place in serving dish. Blueberry: Puree blueberries with juice from one lemon, 1 - 2 Tbsp of simple syrup to taste, and water to thin consistency. Continue to add water until puree is pourable. Strain in fine mech strainer to remove skin. Place in serving dish. Pomegranate: Mix pomegranate juice with 1 - 2 Tbsp of simply syrup to taste. Place in serving dish. To serve fill champagne flutes with a small amount of fruit puree (about 2 Tbsp) or pomegranate juice. If making a Pomegranate Bellini add a teaspoon of pomegranate seeds to the bottom of the flute. Top with chilled Prosecco. The cost of beauty products can add up fast and there aren't many products you can make yourself. But, a homemade sea salt scrub is easy and cheap - I can't believe I have never tried my own version before. I used fine sea salt, but if you have sensitive skin sugar is a great substitute. I purchased the essential oil at Whole Foods. There are so many essential oil variations I would like to try: Thyme, Lemon, Citrus, Lavender, Rosewood, Lemongrass, and more. Combine salt, oil, and essential oil. I never thought I would be up at 10 PM slicing beets with a mandolin and cursing myself for the last batch of overcooked beet chips. I just plain forgot - I sat down on my comfy couch with my roomie, Ashlee, and our Roku and never looked back at the kitchen. I showed the burnt beet chips to Ashlee and she suggested I post them as sweet potato or purple potato chips so the brown coloring wouldn't be so offensive. We got a pretty good laugh out of that one. But, hence I made another batch which turned out to be a much brighter appetizing color. Unfortunately, these little bites may be one of the easier recipes I have attempted over the years. I saw a couple pictures of them floating around on cyber space and couldn't get them out of my head. These have to be better than those veggie sticks I've consumed before. Those remind me of chicken nuggets - you just don't know what they're made of. Using a mandolin slice the beets on the thinnest setting. Brush both size of the beet with olive oil and sprinkle with salt. Arrange on a baking sheet in one layer. Bake for about 20 - 30 minutes, flipping once half way through. Watch carefully to ensure the chips dont burn. Transfer to a cooling rack. Eat immediately. If you were in San Francisco this weekend I hope you enjoyed the amazing weather. It was such a great weekend to lounge about, watch the pro-bowl, exercise, and eat great food. I posted a picture of the pizza on Instagram (which I'm obsessed with by the way). Do you use Instagram? If you do check me out at haylessf! For a healthy end to my weekend I made this salad dubbed 'Great Greens' since it's stocked full of avocado, brussels sprouts, green apple, shredded chicken, and arugula. While I was cooking Allison took pictures of me for my blog! She's an amazing photographer and once she's done editing I'll share some of the photo op with you! Saute sliced brussels sprouts in 2 Tbsp olive oil, salt, and pepper in medium sauce pan over medium high heat until browned. Toss shredded chicken, avocado, brussels sprouts, apple in large bowl. 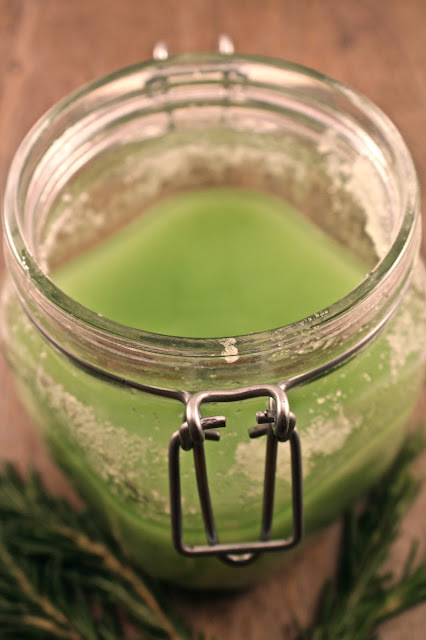 Whisk together 1/4 cup olive oil, cider vinegar, lime juice. Season to taste with salt and pepper. Toss salad with the dressing and season to taste with salt/pepper. Serve. To satisfy my cravings for bread while on the Elimination Diet I decided to give homemade Gluten Free Crackers a shot. I adapted this recipe from Oh She Glow's Vegan and Gluten Free Crackers. These are tasty little crackers with a good crunch. I can't compare them to real crackers, because the texture and taste is different...although surprisingly delicious just the same. I ate my crackers with an avocado/salt/lime combo and leftover Pepita Pesto. Perfect mid-day snack. Preheat oven to 350˚ F. Combine all ingredients except for the water and olive oil in a mixing bowl. Add water and 1 tsp olive oil and mix by hand until the ingredients start to form a ball. I needed an extra Tbsp of water to form a ball. Place a piece parchment paper on a working surface. Begin to roll out dough until it is as thin as you can get it without breaking apart - about 1/8" thick. Brush the remaining 1 tsp of olive oil on top of crackers. Carefully using a knife cut the dough into squares. Place parchment on baking sheet and bake for about 25 minutes or until brown. The sheet of dough should break apart easily. The crackers are best eaten within 2 days. Store in an air tight container. I made this delightful carrot soup earlier in the week and paired it with green salads for a handfull of dinners. The soup is surprisingly filling (I think it might be the coconut milk) and fits my Elimination Diet perfectly. Were you in SF this weekend? It was crazy town - for good reason - go Niners! Saute onion, shallot, garlic, and ginger with 2 Tbsp olive oil in a large soup pot over medium high heat for about 5 minutes or onions begin to become translucent. Add carrots and saute for about 1 minute. Add chicken broth and reduce heat to minimum. Simmer with the lid on the pot for about 15 minutes or until carrots are tender. Remove from heat. Use emulsifier (or food processor/blender in batches) to puree the mixtures. Once smooth, reheat over low heat, add coconut milk, lemon juice, and salt/pepper to taste. Serve with crushed red pepper flakes to taste.